In this ultra-competitive world of business where there are plenty of competitors, companies are always trying to stay ahead of the competition in one way or the other. This is imperative for the business to stay alive and be relevant. Price is one such area where the competition and rivalry can get real heated. This is because at the end of the day the consumers will look at the price before buying anything. They look for the best quality at the lowest price. There are some cases when companies deliberately reduce the price even if they are barely making a profit in order to attract the consumers. 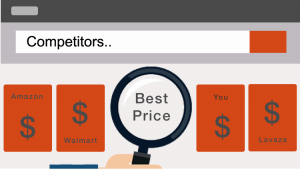 Price-monitoring of the competitors has become an important concept in the business world and has gained a lot of traction recently. This is especially true when it comes to the e-commerce companies. This article is basically about why competitor price monitoring is required. Monitoring the price of the customers will enable the company to understand where the opportunities are present and where the customers are going and what are they choosing. Based on this the company can set their prices and focus on the products that the consumers are looking for. This will help them to stay in the game and also slowly get ahead of the game. The company will not want to be stuck with old stock when the prices are falling. This will put them behind the game and they will have to go a long way to empty the existing stock. This will force the company to sell the old stock at rates that will be a loss for the company. Using competitor information intelligently means the company can always price competitively to ensure stock turnover. Receiving pertinent, valuable information daily helps the company to do its job better. The company will be to be able to react quickly to changes in the competitors’ catalogs and price monitoring of the competitors allows the company to do just this. Quickly testing the impact of adjusting the margin aspirations will allow the company to price the products to be competitive and to increase the margins. Awareness of the competitors’ prices can help the company to leverage better deals with the suppliers. If the competitors can consistently sell a product cheaper than the cost price, the company can use this information to negotiate a better deal with the current supplier or seek an alternative and more competitive supply. This concept of monitoring the competitor’s price is a new concept but it is very beneficial for a company to follow this. Having said this it would be better if a company has its own strategies in place rather than making strategies based on the competitors.